August is here, and with it the last few weeks of rest and relaxation before the holidays, school, and general hustle and bustle of fall. What better time to take a moment and explore some of the remarkable stories on jwa.org? To get you started, the staff at JWA hand-picked a selection of articles, exhibits, and stories that we know you will enjoy. Pull up a chair, grab some iced tea, and indulge in some of jwa.org's "hidden treasures." When it's hot outside, I love to watch movies. This film guide is the perfect tool for planning a DIY film series, with popcorn and lively conversation! Enjoy some old favorites, discover new ones, and consider them with a different lens (3-D glasses not necessary). Betty Comden and her partner Adolph Green were giants in American musical theater, but somehow never got the recognition that other partnerships--like Rogers and Hamerstein--did. The article nicely reflects her career and presents an example of an equal professional partnership that formed in the 1930s--way before the feminist movement "officially" began. I've spent much of the summer studying and discussing the role of Jewish women in the Civil Rights movement with teachers all over the country. As teachers, we are also taught by our students, just as parents are taught and reminded of values by their children. That's why I love this essay about Wednesdays in Mississippi, discussing how parents were inspired to action in the south. I suggest watching the videos too! Checking out This Week in History (TWIH) is how I begin each day. And how every day turns into a special day commemorating a significant moment in the life of a woman whose story I am almost always delighted to discover or rediscover. Celebrate a friend's birthday by sending her the day's TWIH story. Or impress your friends by sharing the day's TWIH story while strolling on the beach or sipping piña coladas by the pool. When I think of summer the first thing that pops into my mind is vacation. Vacation stands for relaxation and spending time with your family, leaving our everyday hectic lives behind. Whoever thought going on vacation was so complicated for Jews in the 1800s? Today, millions of families take a vacation each summer. What is your favorite summer vacation destination? Featuring over 20 interesting and diverse Jewish women, the section is filled with great nuggets of information about each woman, including biographies, fun facts, personal quotes, and more. The profiles are easy and fun to read, while still containing a wealth of material. You can choose a different profile to read each day for the rest of this summer and discover what makes these women cool. We don't often think of American Jewish women as rough and tumble gun-slingers or homesteaders who risked everything to stake their claim in the American West. As an American history nerd who grew up reading Little House on the Prairie, it's amazing to discover the stories of these Jewish women pioneers and the unique struggles they faced as Jews and as women as they built new lives in the wild west. Like most men, I'm a map guy. Since we're taking our stay-cation close to home, I'll be checking out On the Map for interesting places to visit where women's history took place. I'll also be looking for new locations to add to the site at the end of the day from my hotel room (which if I'm in luck will come with wireless and air conditioning). From left: Patrick Dash, Jacqui Kasper, Gail Reimer, Stephen Benson, Judith Rosenbaum, Leah Berkenwald, Alan Kravitz. 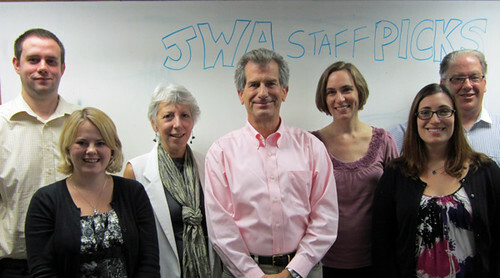 Visit jwa.org to meet the whole JWA staff. I would suggest this book as a good summer read....In Search of the Golden Shiksa by Roger Levine. This is a story of a young man who is Search of the Golden Shiksa. It takes us on many comic adventures over several years of the boys life. It is a well written book that is very entertaining full of lively charaters. I hope he comes out with another book soon. Berkenwald, Leah. "JWA Summer Reading Staff Picks." 8 August 2011. Jewish Women's Archive. (Viewed on April 23, 2019) <https://jwa.org/blog/summer-reading-staff-picks-2011>. Courtesy of Natasha C. Dunn/Flickr.